A year ago at the 2018 Consumer Electronics Show, Alpine introduced their Single-DIN 9-inch CarPlay and Android Auto radio. The Halo 9 ILX-F309 had flagship-level features with HDMI input, a HD Radio tuner, and support for Maestro iDataLink, which gives the device deep integration with the car's telematics like having the car's gauges show up on the radio, climate controls, battery voltage, and check engine codes. In 2019, there's a new addition to the Halo 9-inch product line, the ILX-F259. It has all the same features as the previous F309, but lacks the HD Radio, HDMI port, and Maestro support. But, it adds a new, customizable interface making it possible to set photos as the wallpaper, as well as a photo for one of the interface tiles. Tiles can be large or small, and rearranged in any order, making it easy to set up just the favorites you want, not too different from how you arrange app icons on a iPhone home screen. Where the F309 model has a retail price of $1100 USD, the F259 is set to debut at $800. Following the show, we installed a F309 in our personal vehicle. 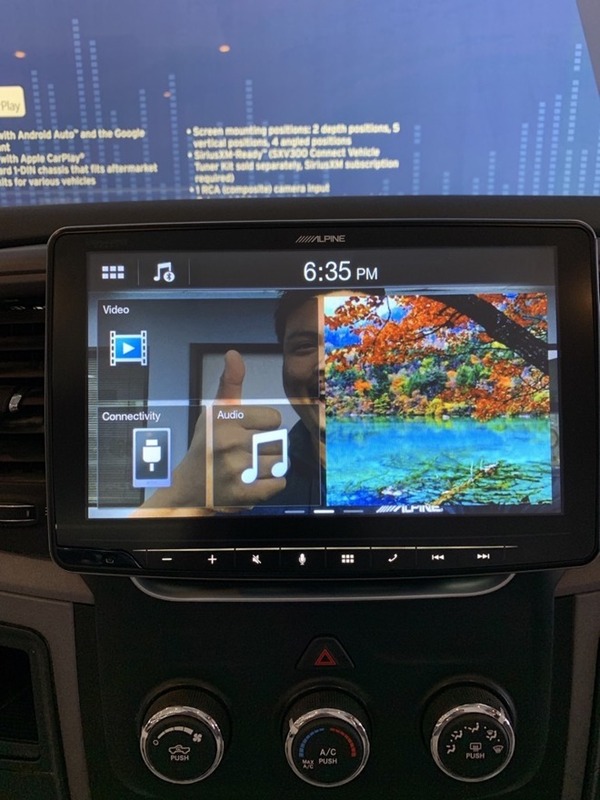 The hardware is good, letting you use a single-DIN space with a large 9-inch display, and the display mount gives you some options for angle and height. Installing a 9-inch screen in front of a center stack dashboard where car designers hadn't envisioned one going is going to block something. 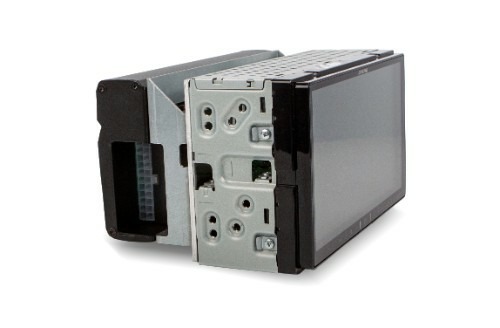 In some cars, this could block heating controls, in others, it could block vents. In our case, we took Alpine's advice, and used a Scosche dash kit that had the option of configuration for single-DIN with a pocket, or double-DIN. Using it placed the single DIN slot higher in the dashboard, and meant that even with the screen adjusted all the way down, it blocked the center vents at the top of the dashboard. 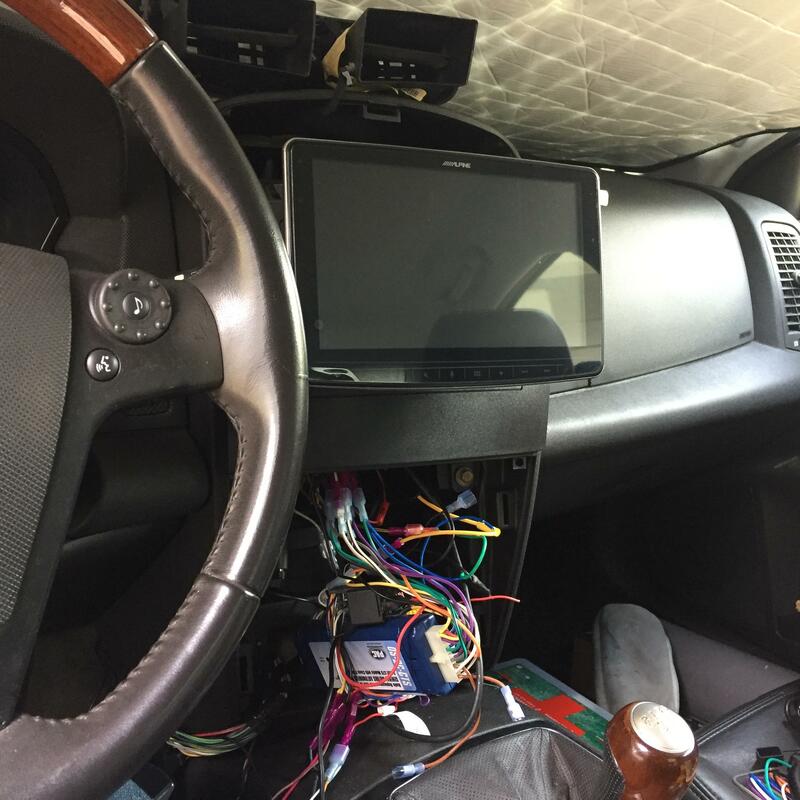 Had we used a dash kit from Scosche's competitor, Metra Electronics, we could have placed the single DIN unit in a lower position and had use of the vents. So, in short, be mindful of what you're going to block and depending on adjustments and mounting kit, you can avoid the worst of it. With the screen at its lowest, the center vents are blocked. The interface for Alpine's CarPlay is both one of the most interesting developments in aftermarket radios in years, and one of the most frustrating. 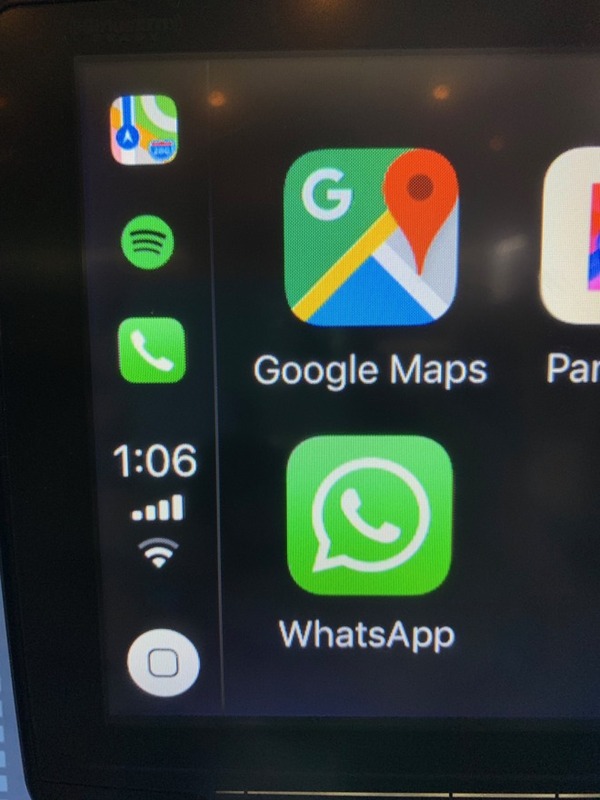 CarPlay and Android Auto are successes because the OEM and aftermarket custom-designed interfaces are so frustratingly bad that there was a vacuum in the space for Apple and Google to say, "forget it, we're going to mirror a good interface onto the screen" -- and that works. Unfortunately for car radio OEMs and aftermarket, it highlights just how bad the defaults are by putting them side by side. Alpine is interesting, because with the ILX-007 and ILX-107, they made units that were CarPlay-only, and followed Apple's example in making the interface for non-CarPlay elements like settings, volume level indicator, and so on. They used everything, right down to the on/off toggle switches from iOS in their settings menu. This interface looks nothing like Android Auto or CarPlay, and that's terrible. For their CarPlay and Android Auto products, they use their own interface, just like every other radio manufacturer. It remains mentally jarring to be thrown out of a good interface into a bad one, like being pulled out of a warm bed and thrown in a cold shower in the dark, especially when Alpine have already shown they knew how to do better a few years ago. What they should do is work on creating an interface that either blends aspects of both Android Auto material design or iOS flat design, or something that looks compatible with both, so that it feels more natural going between them. Why there's a photo behind the interface widgets and a photo inside a widget is beyond me. This is bad. While we were hoping that the customization would be a positive, setting a photo as a wallpaper behind a bunch of interface widgets looks bad. Setting a photo as a widget on top of a photo wallpaper is horrific. In use, it's only slightly less worse than the other manufacturers who let you set wallpaper, but don't have a blank one so you can't get just a black background behind the interface. Alpine should prevent users from making weird choices like this, that's part of their job when they design the interface. 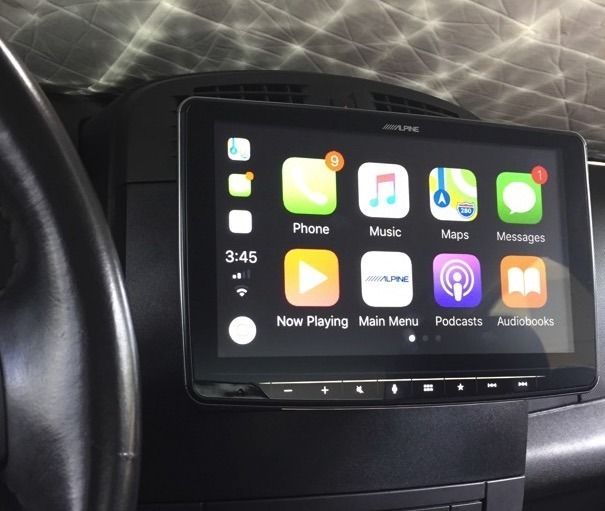 Alpine introduced another CarPlay radio with this new interface, the ILX-W650, in the much more common 7 inch format. All of these systems are what radio manufacturers are calling "mechless", or basically, without motors to run CD drives. The W650 model is very shallow, more so than some other mechless CarPlay units. It's just 2.4 inches deep, which means that it will fit in a variety of cars with ease. What could you do with all that empty space in the dashboard? Alpine thought of that, too. The KTA-450 Power Pack Amplifier attaches to the back of the ILX-W650 radio and together, they take about the same amount of space as any competing CarPlay system takes on its own. The amplifier is rated at 400 DPP (dynamic peak power) watts. Alpine's DPP is proprietary tech, that the company says will give an amp more power to reach high volume demands instead of distorting into a square wave at peak as others might. It was explained to us at the show that during demanding musical passages, they dynamically supply more power to the amp, briefly doubling its power, which is why the physical packaging can be as small as it is. This was hard to demonstrate practically at the show. We'll be looking closer at this in later months. Alpine's iLX-F309 Halo9 receiver is available now for $894.95 at Amazon. Meanwhile, the iLX-W650 can be preordered at Crutchfield for $299.99, while the iLX-F259 will be available in March at Alpine authorized resellers. How did you find installation? Did you do it yourself, and what about the cost of harnesses and the fascia kit? Also, how is the screen? Is the resolution Ok, how does it manage glare in your car? i have been leaning towards the wireless Kenwoods or Pioneers with capacitive screens, but I have a Bose optioned Mazda. To integrate any of these with the Bose amp and keep steering controls adds quite a bit to the cost of installation. 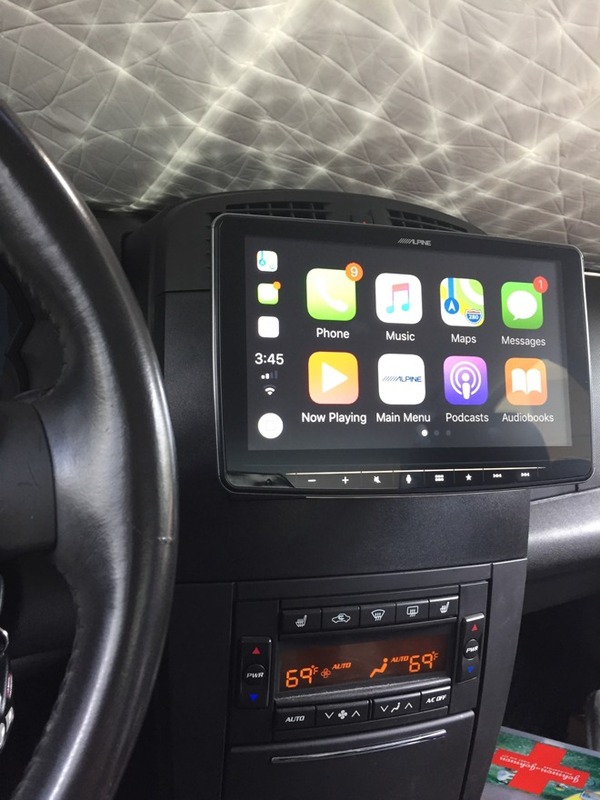 A $900 unit and it doesn't have wireless CarPlay? Big miss. A key question you don't address is whether there is any attempt to support settings for the specific car it is fitted in. Most cars nowadays have a range of settings that you make through the ICE system, and if you swap it out you lose access to these. Have Alpine done anything to address this? I hated it when Mercedes started to have their displays outside the console and now the aftermarket is doing that also? Must be a market out there for it, but I'm not buying.....I like everything flush and not protruding. 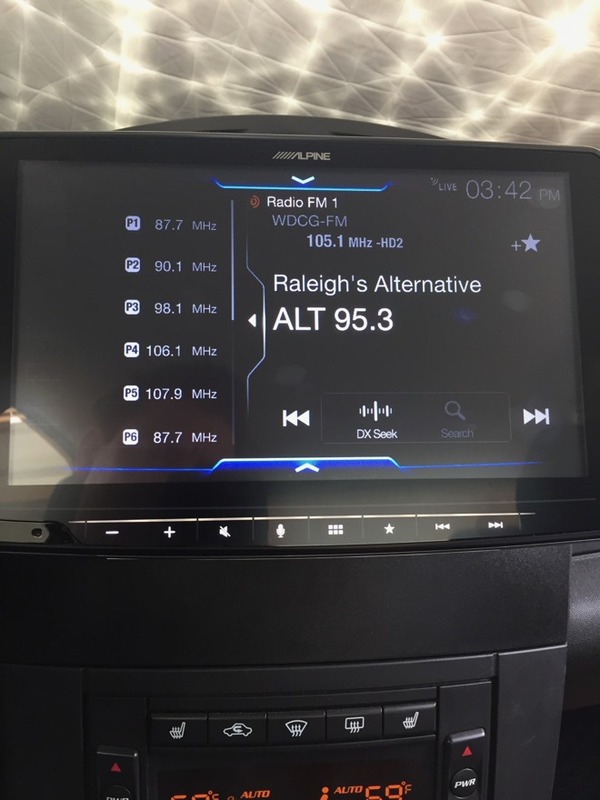 You would have to think aftermarket head units are a diminishing market, as car manufacturers have moved away from stand din and double din units. This means it won’t be cheap, and there isn’t serious investment. Their previous unit, the ILX-107, does have wireless carplay. I reviewed it, here on AppleInsider.com. Not every unit gets all the features. The fascia kit was 20 bucks. The wiring harness for my car is 150, because I also have Bose from the factory, and the steering wheels controller adapter is 40. The wiring harness for my wife's car is 15 dollars. The resolution is the same resolution as every other CarPlay system, so you just get larger, blockier pixels. Glare wasn't bad at all. Resistive makes good sense in cold weather, or occasions where your hands might be wet (drink condensation on that big gulp or bottled evian, to cite stereotypes.) Practically, I have used both resistive and capacitive touch CarPlay, and find that it makes very little difference - you aren't doing a lot of pinch zooming while driving, and if you are, I don't want to be driving nearby you. The problem is that the max you can fit in a double-din is 7 inches. If you want a larger display in an aftermarket display, this is how you do it. You know, I thought so, too, but it seems to be flourishing with the number of models released every year, from a decently wide list of manufacturers. Until good units become standard in every car, instead of AM/FM/CD/AUX or AM/FM/CD/USB, there's a market. 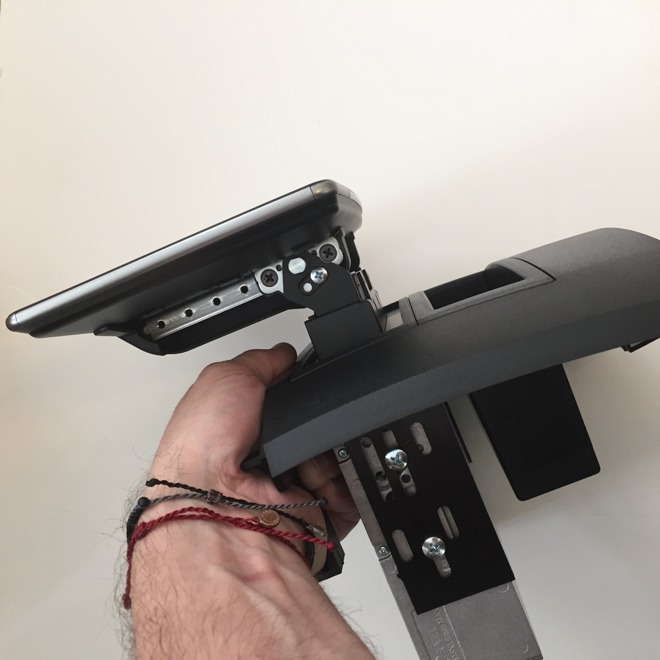 And that goes for the units that do have touch and GPS, but rely on some awful, out of date maps DVD that costs 600 dollars for the updated DVD, and they stop making it after a few years for your model. People keep cars on average for 7 years. People who own Toyotas and Hondas keep them longer, as much as 15 years. Even if new cars come with elaborate, harder to replace systems, that has yet to filter through the market for 15 years, so there are plenty of candidates for upgrades.